The internet has changed how we do everything. And while I am a huge fan of those changes (being able to buy my daughter's future winter jacket on sale at 6am is one I love), I also see their costs as well. The retail world has been turned upside down, as has the music industry, the publishing industry, the world of news. It's amazing and terrifying in equal measures. When I worked in the yarn store, I heard from a lot of people about the online classes on Craftsy. How cool, I thought, you can take a class at home at your convenience and it starts whenever you want! I still believe that. As someone who dabbles in lots of things, I have always taught myself, sometimes erroneously, and enjoyed the process of figuring it out. But having resources there 24/7 to call upon when you run into a roadblock? That's pretty magical. 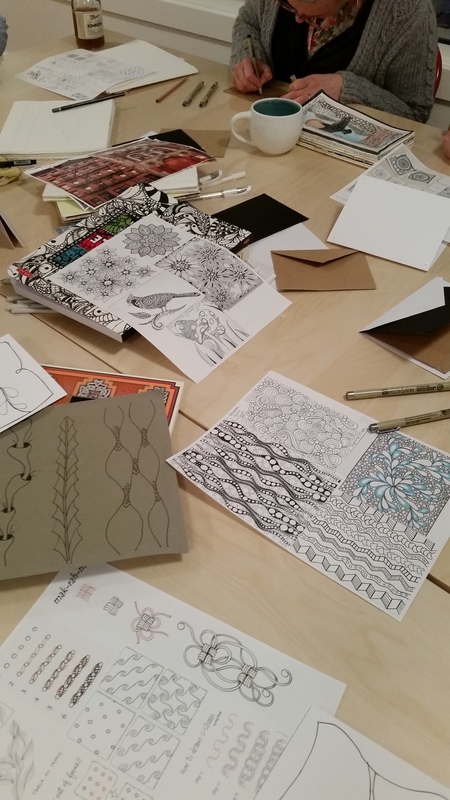 When I took Julia's Zentangle class at Craftstitute, it reinforced something that needs to be said about a classroom setting - often you learn more from someone else's questions than your own. Listening to her tell another student to relax and hold her pen a certain way made me aware of my own physical tension with drawing. Laughing over another's hilarious interpretation of her doodles relaxed me in a way that couldn't have happened in front of a computer. These things happened in the knitting classes I taught at the shop as well. One student's innocuous question about seaming brought to light the fact that nobody understood how important it was to block your knitted pieces before sewing them together to make a sweater. That changed the focus of my lessons for the rest of the session and led to a much better experience for my students. The classroom setting allows for a synergy that just won't happen with an online class - inspiration derived from your fellow classmate's ideas, a comment from a teacher that sets off an entirely new direction of intention. It's magic when it happens, and it happens all time when people get together to create. Did I mention the laughter? Our goal has always been to build a community of crafters, and I use that word with hesitation as it can have such negative connotations. But what other word is there? And shouldn't we embrace words that are accurate and return them to rightful place by simply using them as intended? See what we talk about at the Craftstitute?